I will admit that it is only May 29th, but this year I achieved my goal. 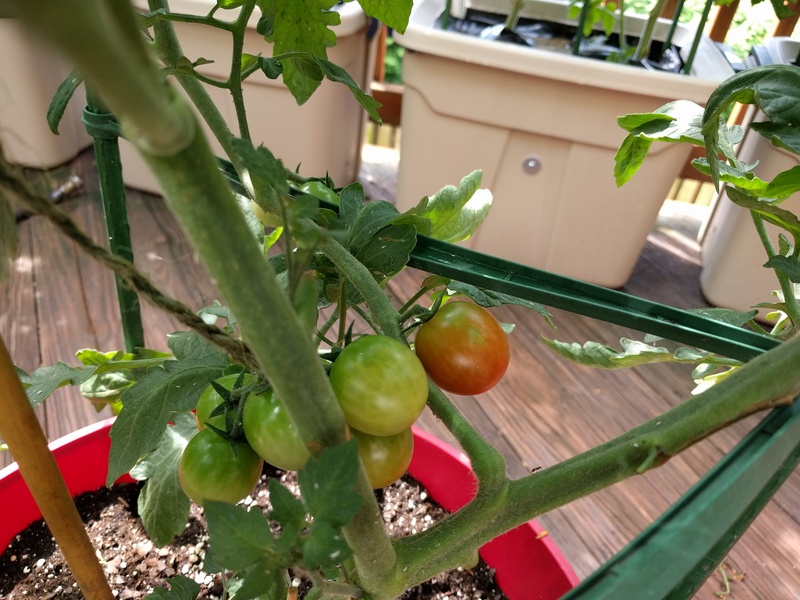 I have a ripe tomato before June. The aphid infestation is still ongoing. I’m going to have to poison some of the ants I believe. They are making nests under the containers and harvesting the aphids. What happens is I clean the plants off on my days off. Then I work a lot or it has been cool and wet and they explode in population. I fight them off again and we go in a big circle. The deck is looking great. The ground cherries are enormous. The fruit better be awesome. The plants are loaded with fruit but none is ripe yet, which I understand. I have veggie pictures but I am waiting for the photo upload to be fixed for the blog. If not, I’ll go back to pushing from imgur as I used to do. 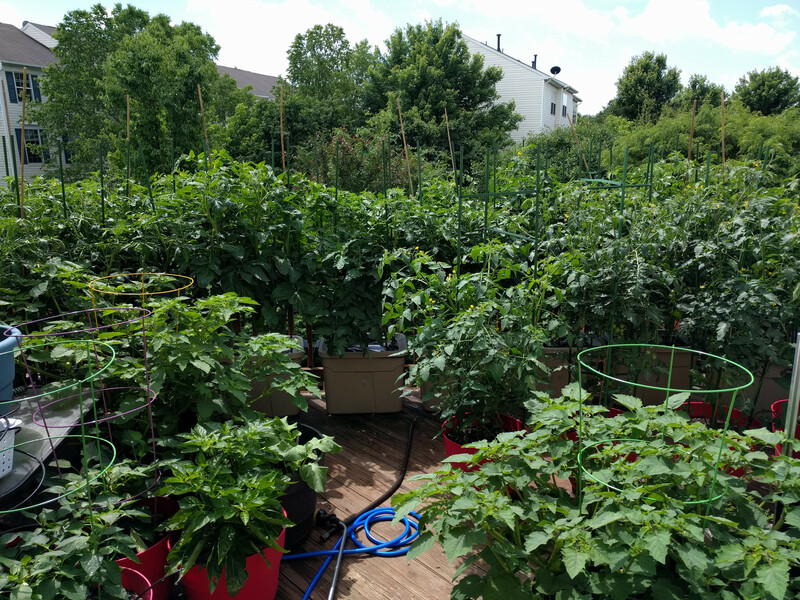 Everything is going great minus the aphid infestation. With my little windfall I have moved my debt pay off ahead by a year. Doing some research led me to dump my emergency fund into the pay off as well. We still have an emergency fund but it is my husbands. Before I made my decision I checked in with him, to his amusement. The fact that we do not share our cash has always left me feeling strange about making assumptions with his money. Yet, for the first time I do and I do so with comfort. It was not until today that I realized this debt free level frees us so much. Before, I needed to work at my job to just pay my bills. Now, I’ll be free of all but my part of the mortgage. If we sell the house, my revolving debt consists of my cellphone bill ($30), netflix, and google play music. What a place to be. Becoming financially responsible has been a long road. I was never terrible but I was often not s good as I should have been. A thousand dollars seems like so much but spends so fast. Payments seem like they will make a dent but the the credit goes down so slowly. And cars did not help. The urge to have a dependable car was strong and a car payment has consumed much of my income. It was also today that I said to my husband my next car will be nice but it will be used. We are past the point that I will pay more to minimize the negatives of working on my car. Gone is the stress from my first years of vehicle ownership when a break down was such a devastating moment. It feels so strange. This year will be my 20th year since I left high school. It hasn’t been all smooth sailing. It has gone very well. Sometimes it feels as if it went better then it should have. Yet, even if a shoe was to drop, I could catch it. It is all very unexpected. Around January, my husband and I got into a discussion about unclaimed money and was real it was. I did some research and discovered that the entire idea of unclaimed money was true. Not only that, the website http://missingmoney.com/ looks like a scam and isn’t. We started with our own state. I found one hit for myself. I checked where I used to live. I then checked my father. He died several years ago and I was his executor. I found several hits on him. I then checked my mother and grandmother. It had to be a scam. Had to. I checked the state websites and only NY had their own website. The other’s had forms and told you to use Missing Money’s website. I was shocked because the website oozes scam to me. But it wasn’t. Today, I got the estate payouts for my father. I feel like an infomercial. Check it. Check your state as well and compare the two. The idea of Missing Money is that companies cannot just keep money that does not belong to them. By having to send it to the state people do not develop create ways to keep these funds. They give it to the care of the state that the person lived in. The state keeps it in an account and the owner can come along and claim it. For my father, one account was for a stock. The other was from his previous mortgage company. It was an over-payment of some sort. For myself, I found an interest refund from my previous vehicle that I had sold. I moved after they sent it and I had used a PO Box in between so they just sent it to the state when they couldn’t easily find me. Sometimes things really do just work. This morning I went to the DMV to renew my driver’s license. My husband and I are both due for renewal within a week of each other. He is going to be out of the country when his driver’s license expires. I’ve been pushing to get it done and this morning we woke up at the ungodly (to us) hour of 0700 to go. It was a much smoother process then I expected. The cold, overcast skies kept people away. The middle of the month is a much safer time to go. There are fewer people rushing to meet deadlines for expired things. I saw couples getting titles for new vehicles and a mother bringing her daughter in for her learner’s permit. My husband was grumpy. He is such a grumpy, growly person in the mornings. I finally stopped trying to talk to him. Thankfully, we waited for about fifteen minutes before his number was called. Another five minutes later, I was called to the opposite side of the line of counters. I asked a few question to the puzzlement of the staff member. The application asks if you have or have ever had a driver’s license from another state, territory or country. It then asked for the number and the date it was issued and expired. I changed my license to this state ten years ago. How am I supposed to know what my driver’s license number, issue, and exasperation dates where? He tells me that is only for people coming in with new licenses. I stared at him and commented that ‘ever’ is a rather confusing term. #7 was the 16 year old girl getting her learners permit. There is a row of stalls where the tests are done. Above their walls is a mirror. They called her out and her mother over and told them she couldn’t retake the test for two weeks due to cheating. Her mother seemed so confused. She walked out and then came back and to my delight, asked for details. My husband says that he blames the parents for not making sure she was prepared. I can see that. I remember walking around with my manual reciting passages and begging for quizzes. On one side I thought that she should have not had her phone. On the other, she should not have cheated and her ability to resist temptation is part of growing up. A part that she failed. It also makes me think, what else does she cheat on? To cheat at the DMV is a rather aggressive first attempt. To me, this means it is not a first attempt. I am trying to learn to like sweet peppers. Last year, my mother gave me a piece of a very ripe red bell pepper. It wasn’t horrible. Green bell peppers make me want to vomit a bit. This was not awful and it started me on my quest for tasty sweet peppers. This year I am trying the miniture chocolate bell pepper, red cheese peppers, and heatless habanaro called habanada. This is a red cheese pepper. I have a few other peppers peeking out on their plants. It looks like it will be a good year. On the 13th I dropped my plants. I was very, very annoyed and mad. I was mad at myself. I was trying to do a lot before I ate anything and right after waking up. I broke one of my Sungolds and for a moment I was going to throw it away. Instead, I figured that I’d give it the chance to recover. That was the broken stem. I incorrectly attempted to root the old top. That shriveled up and died. I did learn some about rooting. Here it is today. I just planted it out. It is half the size of everyone else and it has grown two main stems. It is a strong, healthy looking plant with great roots. I expect an explosion of growth over the next few weeks now that it is moved to a bigger container. I’d have moved it earlier but my time has been rather hectic. I’ve not had the energy to go out late and night to go shopping and avoid traffic. My days off have not actually been days off. Still, we’ve gotten there. Next is setting up my drip system. I purchased new hoses. I made the mistake of not pulling my hoses in for the winter and the seals are all blown. I’ve worn glasses most of my life. In 2006, at the age of 26, I decided to get lasik done. I really couldn’t afford it but I was in a pretty good point financially and decided to pay it off. It all worked out and that June I put my glasses aside. It has been eleven years. I’m looking at my thirty eight birthday. I need to renew my driver’s license and I have not been going to the eye doctor. So, I finally took a deep breath, found a local office that takes my insurance, and went. Things seem fine. It seems I may be prone to dry eye later in life. She said that my ducts are narrow and my oil glands seems grumpy. I’ve never had a dry eye issue. I’m going to have the big scan done later this month. Things look fine for the most part but there is always a bit of discomfort and fear when facing a new medical procedure. Fear. What is wrong with me. What will be wrong with me. What can I not stop from going wrong? Morality haunts me. I enjoy my life and my senses. But, I’ve learned that I won’t always work perfectly. I was diagnosed with high blood pressure when I turned 31. I can only manage it because at 31 my biological destiny clicked on. Now, instead of cheerful lack of worry I find that something like an eye exam makes me hope that there is no shoe to drop.